Dizzy Working Mom: Ben's Naps and a Schedule Update! Ben's Naps and a Schedule Update! Can we go out to the backyard, please? My last schedule post was at 11 months, so I thought I would do an update. I like to do the schedule updates, because the schedule thing was the whole reason I started this lil' blog. I was searching for a schedule I could follow when I returned to work for a family with two commuting/working parents and a baby. It's funny, because at the time it seemed almost impossible (which is ridiculous, because there are a million families out there with tons of children who make it work). But still, for my little world, it was a big change and I wasn't sure how I was going to fit it all in. Since the beginning, it has gotten so much easier. I think this is due to multiple factors, most importantly Ben just getting older (sob), me adjusting my schedule, and all of us finding our groove. Not too much has changed since 11 months though, so it is kind of boring! But there are little changes here and there. What has changed in that time is Ben's nap schedule. Up until a couple of months ago, Ben would have a morning and an afternoon nap. His morning nap was usually the longer one (a couple of hours, normally at about 9am-ish). The afternoon nap would be shorter, but occasionally also a couple of hours (on miraculous weird days OR when he was sick, poor guy). But sometimes, he would just skip the afternoon nap, which was hellish. Like my hair? They started doing that at daycare (I think using food remnants as hair product). Daycare Perk! A couple of months ago, they started transitioning him to a solo afternoon nap at daycare when he became part of the mobile infant group (which is a precursor to moving into the toddler room, gulp). I was totally against it at first. I thought he really NEEDED that morning nap. He seemed more cranky and not as well rested. For a month, I still gave him morning naps at home. But then, I noticed that the afternoon naps at daycare were substantial and that he did seem well-rested. He had transitioned to it well. So now, we are in a good spot. He does one nap at about 12:30pm and normally sleeps for at least two hours (sometimes three). I have found out that I really like switching to just one nap. It is nice having that big block of time in the morning to be free to do things with him and as a family. I think this is one of the examples of when daycare was a perk (although I was super annoyed at first), which I talk about here. 5:45am - Dan wakes up, gets ready. 6:00am - Dan wakes me up, I beg him for five fifteen more minutes. I finally wake up around 6:15/6:20 and get ready. I shower or bathe the evening before, so during this time I put on my make-up, straighten or curl my hair, and get dressed. 6:20am - 6:40am - Dan usually leaves to go retrieve his Starbucks. If it is a Tuesday, he also drops Shelbs off at doggy daycare during this time. * I go downstairs and make all of Ben's bottles for the day (one for the morning, and three to take to daycare. Remind myself at this time that I *really* need to start transitioning to sippy cups). I pack any other items in his daycare bag. 7:00am - 7:15am - I wake up Ben, hold him for a bit, give him his bottle, change his diaper, and pick out his outfit. 7:15-7:25am - I call down to Dan, and he comes up and dresses Ben. I get all of my stuff ready for work (make my coffee, pack any food I want for the day). 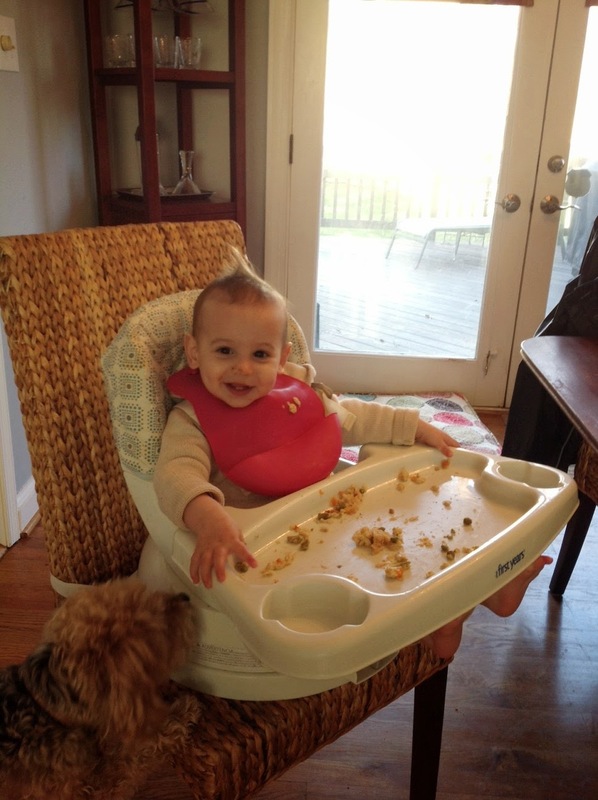 Dan brings Ben downstairs and puts him in his highchair with some cheerios/puffs and usually some sort of fruit and grain pouch. I eat a bowl of cereal and have deep conversations with him over our breakfasts. I may take this time to quickly clip his nails (at the breakfast table??? Gross I know, but that is always when I realize how long and scraggly they are), brush his hair, do a quick wipe-over. 7:30am - We all leave the house at the same time and say goodbye to Shelbs. Then, I kiss Ben and Dan goodbye, and we get into our respective cars. 7:30-8:00am - Commute to work. I drink my coffee on the way. Unless there is terrible traffic, I actually don't mind the commute. It is some time to either space out or think about what needs to be done at work that day. 7:45am/8:00am - Dan drops off Ben at daycare and heads to work. 4:00pm - I leave work and drive like Cruella Deville to daycare, because I miss my son. I may call my sister or a friend (using Bluetooth! I'm safe!) and chat on the way there. 4:30pm - I arrive at daycare to pick up Ben. He is normally walking around like he owns the place. I love to see him before he sees me. I melt a little watching his face spot me out and light up. It's a little strange when I look around the room and realize he is one of the older babies now. They really do grow up so fast! (tear). 4:50pm-5:30 - Hang out with Ben. I let Shelby out, and we play for a while. Now that it is lighter and warmer out, sometimes we take Shelby for a walk during this time or walk around the backyard. Ben LOVES the backyard. He has started to throw little mini-fits when we don't go in the backyard. He stomps his little feet and cries. It is hilarious now (because he usually gets over it in like a minute). Probably not so funny if he is still doing that in a few months though. 5:30-6:15pm - Dinner time! Ben and I normally eat around 5:30pm/5:45pm. I might have thrown something in the oven when we got home or had something cooking at home during the work day. I talk a bit about dinner time here. Sometimes, Ben and/or I will wait to eat until Dan comes home if he is getting home a bit earlier, bringing dinner home, or if Ben just doesn't seem to be overly tired or hungry yet. 6:00/6:30pm - Dan gets home. At this time, I am either having dinner with Ben, waiting for Dan to have dinner, getting Ben into the tub, or hanging out with pajama-ed Ben. 6:15-6:45pm - We finish dinner. I usually bathe Ben (I have started doing this almost every night, because he is such a messy eater), and Dan cleans the kitchen, but sometimes this is flipped. If I have made something really messy, I give Dan the choice of either bathing Ben or cleaning the kitchen. I make sure to inform him that this includes any dirty pots or pans. He almost always chooses bathing Ben. Dan cut himself on a pot once (I know), and now he is scared of them. 6:45-7:00pm - Dan usually hangs out with Ben while I get stuff ready for bed for him (bottle-making, pacifiers in the crib, straighten up Ben's room and bathroom). I remind myself at this time that we really need to seriously consider how we are going to wean him off the pacis. 7:00pm - Give Ben his bottle and rock him for a while. He is usually asleep by 7:15pm. Dan normally washes bottles while I am putting Ben to sleep. 7:30pm-10pm- I normally go straight to the bathtub for a hot bath after Ben goes to sleep. Then, Dan and I watch some tv and chill. I may do some laundry. I do not pick out my clothes for the next day. I like to do that in 30 seconds the morning of, preferably from a wrinkled pile on the floor. 10:00pm - That's a wrap! We go to bed. Wash, rinse, repeat. *Shelby goes to doggie daycare on Tuesdays because that is when we have the housekeeper come (I can't leave her there or else she would totally annoy them the whole time). Although the housekeeper only comes every other week, it is easier to just keep our schedule consistent each week with the dog walker. All other days (except for Wednesdays**), our sweet dog walker comes to walk Shelbs in the middle of the day so she can do her business. **I work from home on Wednesdays now. Our schedule is still pretty much the same, except for I sleep in about a half hour later, because I don't have to get ready (or even brush my teeth!!!!). Ben still goes to daycare, etc. etc. I have a little bit of guilt about this. Many times, when someone finds out that I work from home one day a week, they ask if Ben stays home. When I say no, I feel the need to explain myself. If Ben stayed home, I really wouldn't be able to get any work done (except for possibly during his nap). 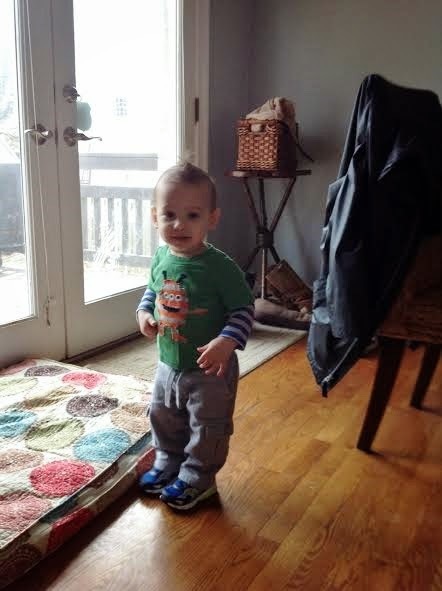 He is constantly moving (and falling), running everywhere. I couldn't expect him to sit quietly and play while I worked. It just wouldn't happen. But there is a feeling of guilt when he goes off to daycare, and I stay home by myself. Maybe when he is older, he can stay home on my work from home day (like when he can play on his own) if he wants to. I really enjoyed reading this. I've been looking for a Blog of a Working Mother. Your schedule is very similar to my family's and it's just so interesting to read. And your little one is adorable.